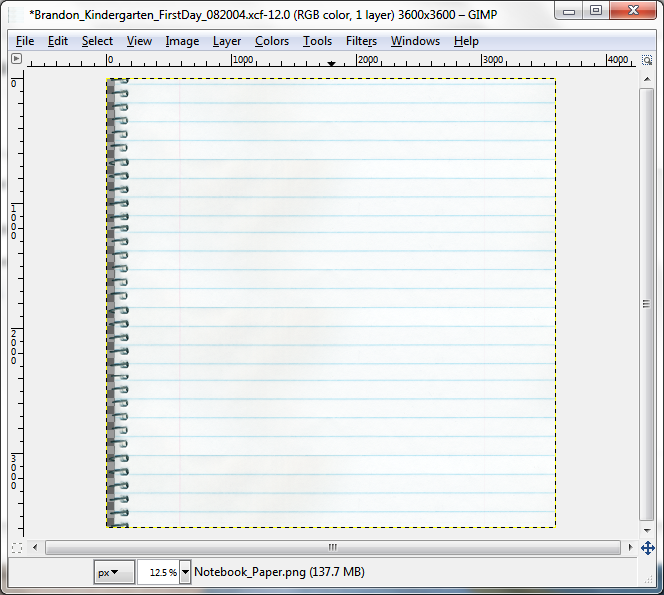 When we left off, you had just added the notebook paper layer to your first digital scrapbooking layout with GIMP. Are you ready for more? Please, please, please... if you find that you're struggling with any part of this, leave me a comment. I really do want you to come out the other side of this knowing how to use these tools well! Let's play with our alpha next. I generally like to work on my page from the outside in. No specific reason, but that seems to work best for me. Go back to the folder where you extracted your School Days files and open the Alpha folder. Under that folder, you should see two more folders--one entitled Letters and one entitled Numbers. The Letters folder contains... um, right... letters. 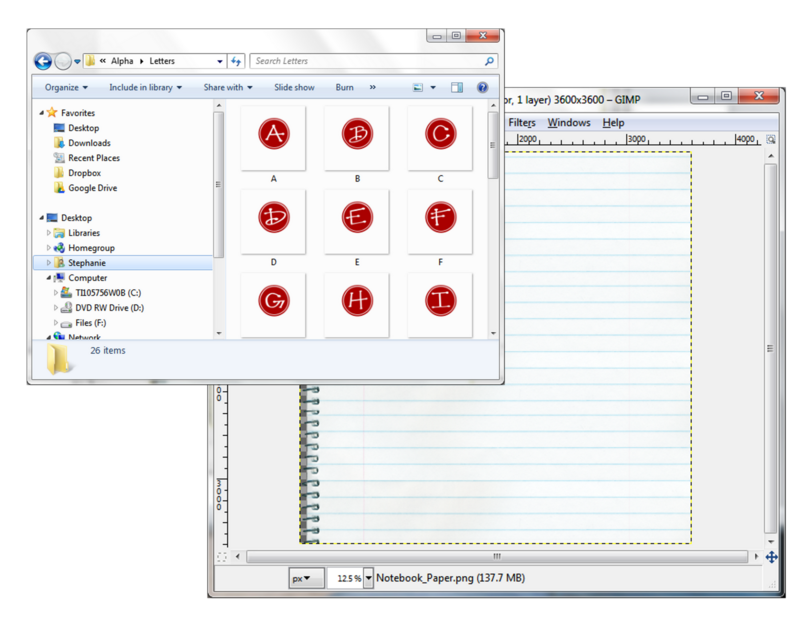 And the Numbers folder contains... you guessed it, all of the numbers (plus a couple of brackets and an ampersand). Notice the file name at the top, now that you've saved it. 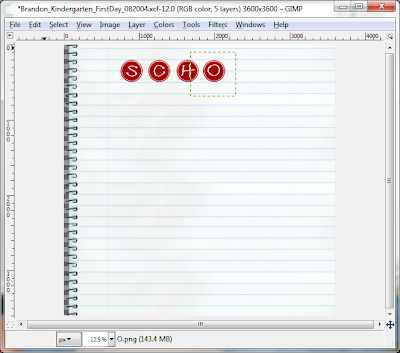 The fact that the S.png layer is listed first means it is on top of the Notebook_Paper.png layer. 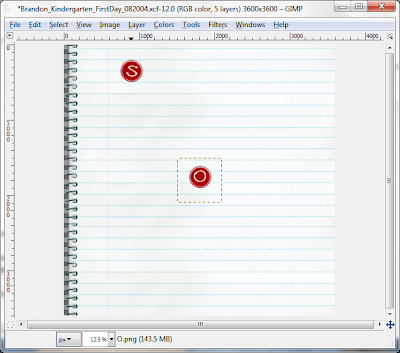 If you picture that in your head, the way it would be if you were working with a physical piece of notebook paper and an alpha cutout, the S would be sitting on top of the piece of paper. 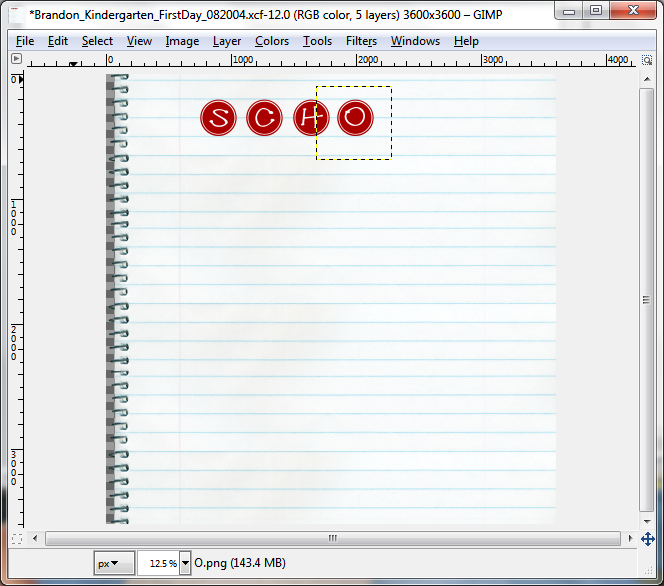 You can change the order of the layers anytime you'd like by clicking on a layer and dragging it. 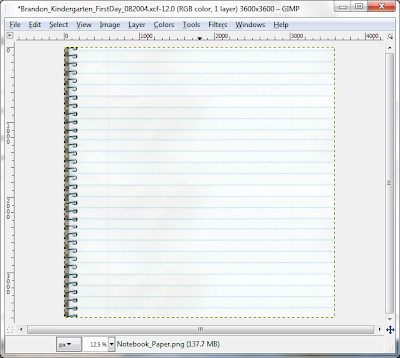 In our current file, let's say you actually wanted the Notebook_Paper.png layer to be first on the list (top of the pile if you were working with an actual piece of paper). 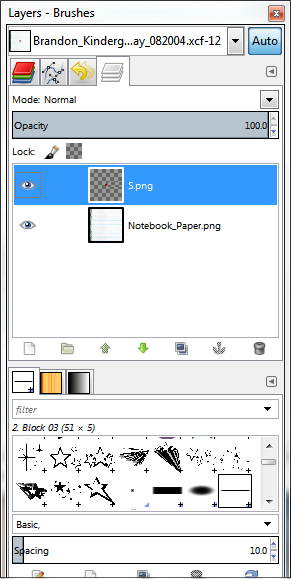 In the Layers Dialog, click on the Notebook_Paper.png and drag it above the S.png layer. 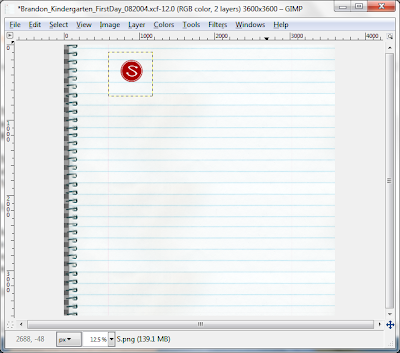 Did you notice in your work area that the letter "S" is no longer visible? That's because you put the Notebook_Paper.png on top. The "S" is still there, but it's underneath. Make sense? 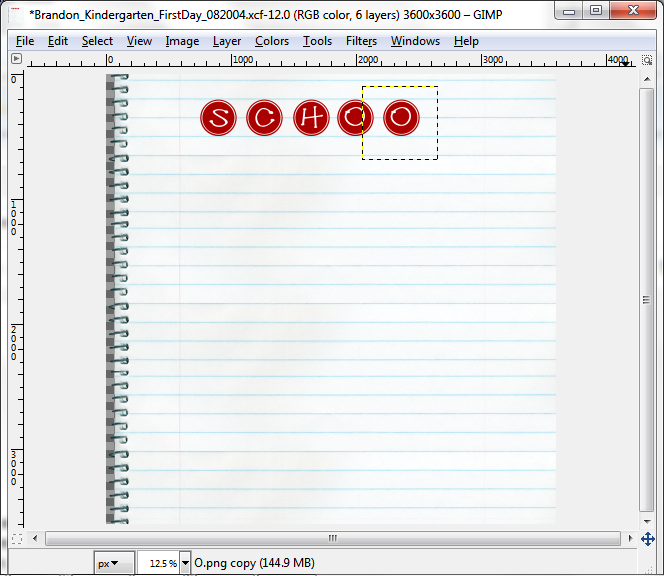 Let's go ahead and move the S.png layer back to the top, because that's really where it should be. Just wanted to give you a little illustration of how layers work. Remember in a prior post when I talked about the value of layers and how they enable you to move things independently of each other? Now is the time to really see how that works. 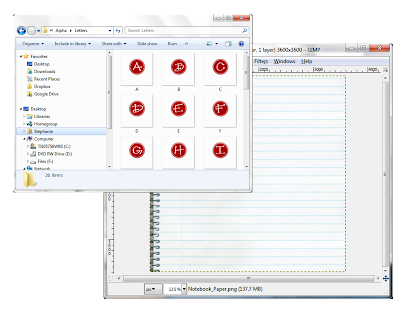 The default selection for the Move panel (if you hover over the icons you can see what each is for) is to move layers (the red box icon is for moving a selection and the one to the right of that, the one that looks a little bit like a telescope, is to move paths--neither of these are options we'll use for awhile). 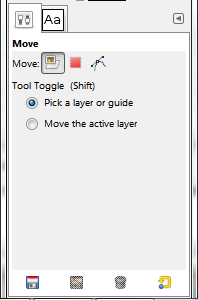 The default selection under Tool Toggle is "Pick a layer or guide". That means that you point, click and move whichever layer you want to. The other option, which can be handy (especially if something is not visible), is "Move the active layer." That enables you to move whichever layer you've selected in the Layers dialog. For now we want to leave all selections at the default. Let's use the Move tool to move our "S" up to the top and left of the page. Click on the "S" and drag it to the top and left. Did you notice when you hovered over the "S" that you saw a four-way arrow? 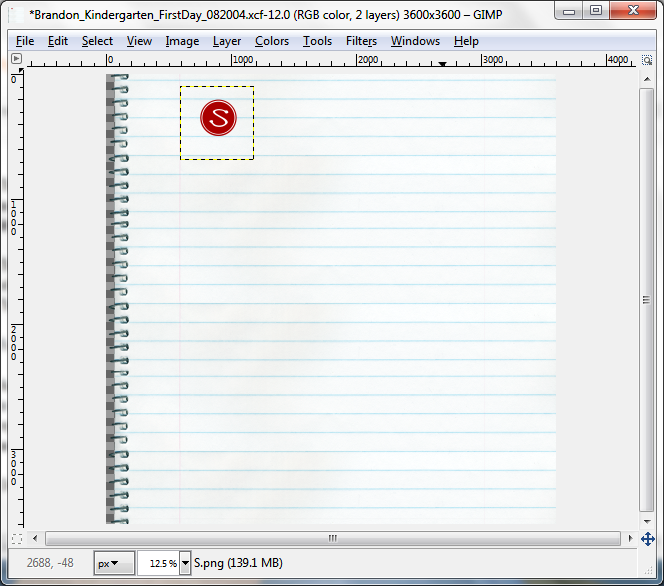 You see this shape when the mouse is hovering over the active layer--the one that's highlighted in the Layers dialog. When the mouse is hovering over a non-active layer, it looks like a small hand. You can click and drag active or inactive layers, it's just helpful to know which one is active. Did you also notice when you clicked on it that the dotted line around the "S" (dotted line represents the layer boundary) turned solid? 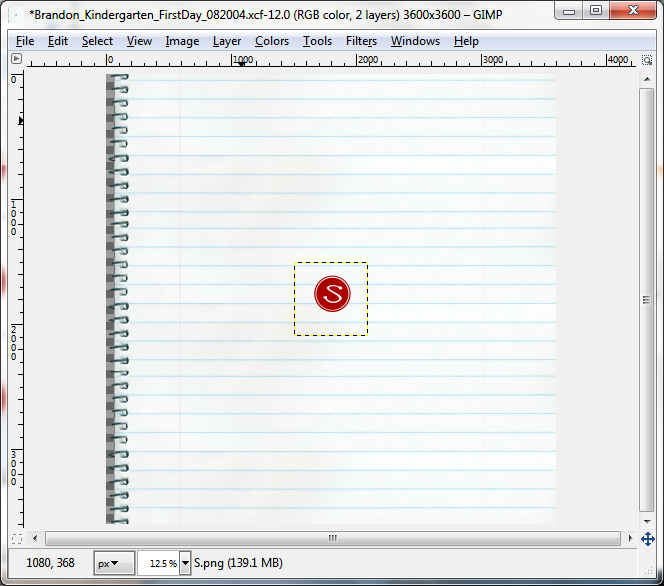 As long as you hold down the mouse button, it remains solid, and that's your indicator that you have the right layer. Good so far? If yes, yay! If not, stop and leave me a comment. We'll get you back on track. Let's add some more letters. 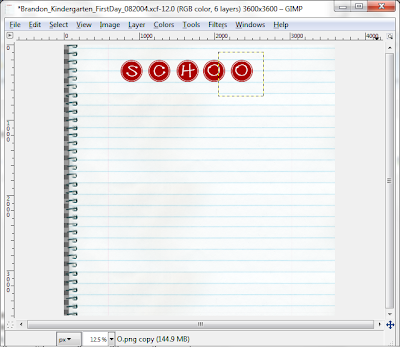 Just click on each letter from the Letters folder and drag it onto the work area. Start with "C", then "H", then "O". No need to move them just yet, just click and drag. Hmmm... anyone know why that is? Yep, you guessed it. It's because the letters are on top of each other. They're all there, but it's like they're stacked neatly in a little pile and all you can see is the "O" because that one's on top. Now, we need another "O" and we have two ways to do that. We can drag the "O" over from the Letters folder like we did before and move it where we want it, but we can also just duplicate the "O" we already have. For the sake of illustration and because duplicating layers is an extremely useful capability, let's duplicate the "O" we already have. Then right-click and from the pop-up menu, select "Duplicate Layer". Weird again, right? Nothing noticeable happened, except that now you see "O.png copy" in the Layers dialog. Must mean that the "O" is there somewhere, but where? It's actually in the same exact place as the "O" before it, just on top of it. So if you hover over it with your mouse, click and drag to the right, you'll see that you do, indeed, have an exact replica of the "O" you dragged in from the Letters folder. 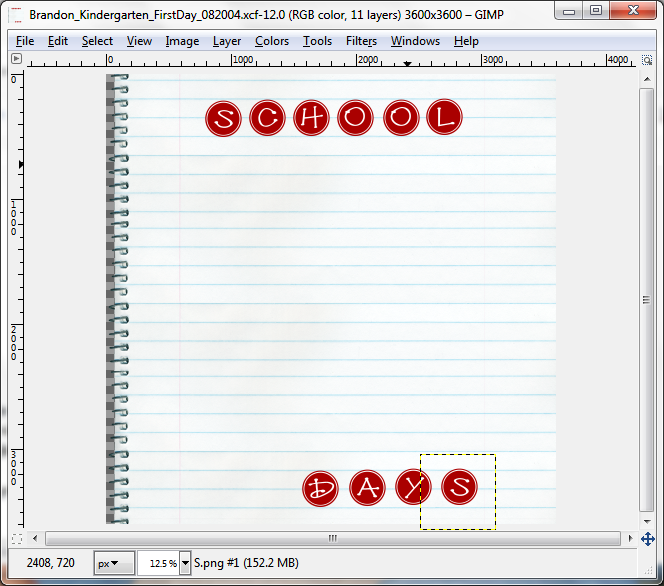 Let's add the rest of our letters--the "L" for "SCHOOL" and each letter of DAYS. Click and drag, just like you did previously, then move them to where you want them. I'm going to put the word DAYS down at the bottom, slightly to the right. 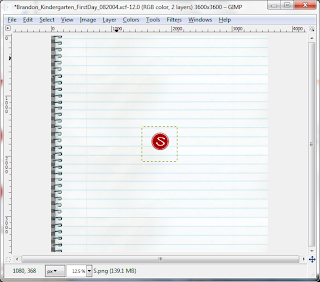 Save your work by selecting File and Save from the work area menu bar. If not, leave me a comment and let me know. If you are, leave me a comment and let me know what you think about the experience so far. And then hang in for the next one. We'll look at cropping your photo. Love this blog. That's all. Keep it up. Guess that wasn't all! Love you. I'm behind the pack but had some "me" time tonight and got through part 2. I'm enjoying this. Your instructions and screenshots are perfect! Thank you. -Vanessa R.
Yay Vanessa! How's it coming along now?